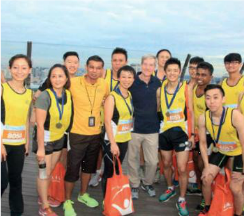 Marina Bay Sands (MBS) held its fifth annual Sands for Singapore Charity Festival in 2017 with overall results again surpassing previous years’ efforts. A primary initiative for Sands Cares in Singapore, the week-long festival raised S$3.9 million (USD $2.8 million) for local community charities and welcomed more than 20,000 visitors to its various events. Since 2013, Sands for Singapore has raised more than S$20 million (USD $14.7 million). Funds raised through the festival were distributed to more than 80 local charities supporting a range of causes. 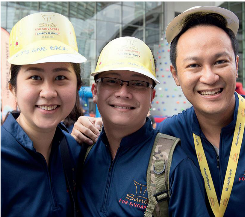 This annual property-wide effort is made possible through the support of Team Members who contributed their time and resources to make it a success – 2,403 Marina Bay Sands Team Members volunteered a cumulative 6,033 hours to make the festival a success. The Sands for Singapore Charity Festival opened with a fundraising concert by The Sichuan Orchestra of China, headlined by Grammy-nominated Singaporean music conductor Darrell Ang. Proceeds from the concert’s ticket sales went to Art Outreach’s IMPART Awards scholarship fund to support the development of aspiring young curators and visual artists in Singapore. MBS was also a co-organizer of the Community Chest Heartstrings Walk and Race to the Sky Vertical Marathon. The event drew more than 8,000 participants in the 4K Fun Walk. In an effort to promote inclusivity, the Community Chest Heartstrings Walk featured a Family Carnival in which nearly 60 benefciaries, including people with disabilities, seniors, and at-risk youth, participated as volunteers and game masters to guide the public in various activities. They were also joined by 35 Team Members and other corporate volunteers who assisted during the walk. The event raised more than S$1.77 million (USD $1.3 million) for benefciaries of Community Chest, a fundraising platform that donates funds to more than 80 social service organizations in Singapore. More than 30 adult teams and 21 junior teams spent a morning participating in the signature Play It Forward Charity Challenge. From the Sands SkyPark down to the ArtScience Museum, Play It Forward took players around the integrated resort, completing intellectual and creative challenges to win cash prizes for local charities. The event also featured a Play It Forward junior charity challenge designed for children 7 to 12 years old as a way to start giving back at a young age. The third edition of Play It Forward resulted in S$120,000 (USD $88,624) in cash prizes to local charities. 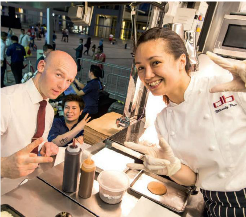 The inaugural Sundown Picnic transformed the property’s Event Plaza into a picnic setting, complete with live music and food provided by Marina Bay Sands dining establishments and celebrity-chef restaurants. All proceeds from food and beverage sales during the three-day event were donated to Community Chest. Nearly 600 Team Members worked in unison to pack 20,000 hygiene kits for Children International benefciaries in the Philippines. Volunteers were broken into 39 teams racing to be the fastest to pack 500 hygiene kits. The winning team from Banquets was victorious with a time of 10 minutes and 27 seconds. With S$8,000 (USD $5,906) worth of cash vouchers contributed by Team Members through the Service Anniversary initiative, 63 Team Member volunteers joined six student benefciaries from Cerebral Palsy Alliance Singapore (CPAS) to purchase groceries for financially vulnerable families. 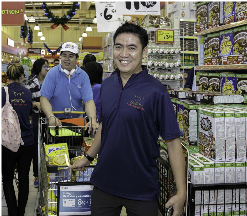 The groceries were personally delivered to each of the 61 households located across Singapore. To learn more about CSR programs and initiatives at Las Vegas Sands, including Sands Cares, read the 2017 Corporate Social Responsibility Overview.